Multiple challenges arising at the same time can threaten the very existence of a start-up. Here are some tips for surviving a meltdown. For new organisations, survival is the first prerequisite for growth. Yet small organisations usually fail. Across the EU, over 50% of businesses fail within five years1, a similar figure to the US. When this happens, budding entrepreneurs often blame macro-economic factors.2In my experience, however, the reasons for business failure are closer to home: insufficient capital, poor market information, operational inefficiency and inexperienced leadership, to name a few. So what can entrepreneurs do to improve the chances of survival of their business? Starting a new organisation is exciting – really exciting. You hammer out a strategy, start market research, talk to friends, colleagues, family and anyone else who will listen and comment (hopefully positively) on your master plan to disrupt and exploit well-established markets or the political and societal status quo. Then you get some funding from somewhere and bang! It is onwards and upwards! Then the reality and grind start. You are tired, seriously tired. Making the launch a success was a huge effort, and you drew on reserves you didn’t know you had. Then you start dealing with people who, frankly, are not as nice and optimistic as you are. Clients want value, quality, service and innovation. The trouble is, they want it immediately. Then there are suppliers: they have seen it all before and, quite unreasonably, they don’t want to give you credit, nor do they see any reason to disrupt their delivery schedules to deliver more promptly. Then your funders start pressing you for reports and, all too soon, break-even and even profit. Your staff have meanwhile miraculously turned from highly qualified potential geniuses into unenthusiastic clock-watchers, lacking your sense of urgency, attention to budget and judgement. You and your partners stick with it but the expected results don’t materialise. Your sales people are promising great things, in fact, amazing things – for next year. Cash-flow has become cash-drain and the bank will only agree to factor your invoices if you put up additional security. You do not have it. You are facing imminent meltdown. The first step is to get the information you need to take stock of the situation, including financial, market and stakeholder data. Prepare a day by day cash-flow forecast for the next 30 days. An accompanying monthly cash-flow forecast for the next 12 months is also important. Include these cash-flows in your normal management accounts. If cash-flow is the pressing problem, then discuss and decide the prioritisation of expenditure with those people who have the power to alleviate or worsen the situation. These are your stakeholders, the vested interests. You need to analyse and understand their position and attitudes if you are going to avoid a meltdown. But before you do this, you need an overview of your sales situation. The status of your new business pipeline. 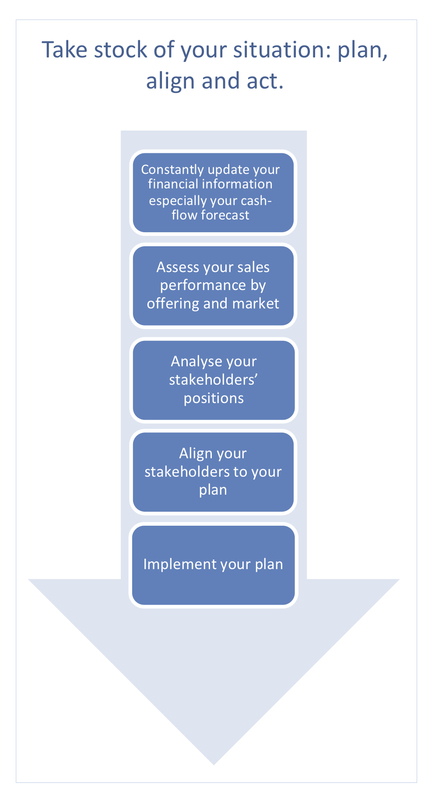 Once you have a clear picture of your sales performance, then you will be able to take the next step to manage the meltdown –assessing your stakeholders’ positions. 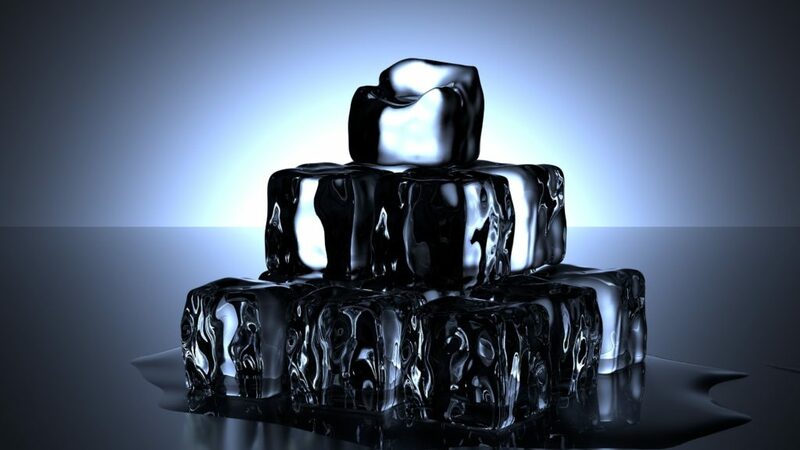 Surviving a meltdown may only be possible if you can align the interests of all your stakeholders. These include shareholders, funders, board members, partners, employees, clients, beneficiaries, agencies, suppliers, regulators and government departments, local government, unions and, last but not least, you and your family. Think about what each of these stakeholders’ interests are. Never assume that you share the same goals and aspirations, and never assume that their actions will be in the best interests of the organisation. A stakeholder’s position can change significantly in a short period of time. Investors, for example, will initially be looking for generous financial returns on their investments. But as things start to go wrong, they may be perfectly prepared for the company to cease trading immediately if it means they can get some of their money back. Or on the other hand, a board member may be prepared to let the company go under so he can exploit the weak situation and launch a phoenix that will benefit for free from assets such as R&D or the company’s sales network. The first step in the analysis is to list each stakeholder and define their stake and motivation. Then list what you believe each stakeholder’s preferred course of action is going to be and note the likelihood of each stakeholder being persuaded to support your own preference. Be gracious in thanking stakeholders for their past support. Ascribe blame to others and never blame those who are able to defend themselves. Start your alignment process with those stakeholders who are most likely to be supportive. Build a coalition of support. Once you have alignment from one stakeholder, inform the others. This can validate the stakeholder’s decision, reduce any sense of abandonment or powerlessness the stakeholder may feel and encourage others to align. Keep those stakeholders who are closely involved in running the organisation and its operations (managers, staff) briefed as much and often as possible. Support them emotionally and demonstrate your leadership and loyalty. Without risking your suppliers’ funds, maintain market confidence by delivering high service levels and quality product irrespective of financial or resource restrictions. If your organisation is in meltdown, you need to fight hard to have any chance of survival. But it is also important not to stubbornly deny fatal flaws if they cannot be realistically remedied. If the correct decision is to pull the plug on the organisation, then do it in a manner that will minimise stakeholder losses. On no account walk away and leave someone else to clean up the mess. This will open you up to a myriad of unseen negative consequences (legal, social and financial) plus a trashed reputation. If you undertake the unrewarding and dispiriting task of winding up the organisation, then you will learn better from your experiences, maintain your integrity, protect your reputation and retain your ability to try again.